This production line is used to produce the filter elements for the automobile filters, hydraulic filters, purification filters and water treatment filters etc. I. General Description: This production line is used to produce the filter elements for the automobile filters, hydraulic filters, purification filters and water treatment filters etc. The pleating height, width etc specification can be customized according to the specific requirements of yours. II. 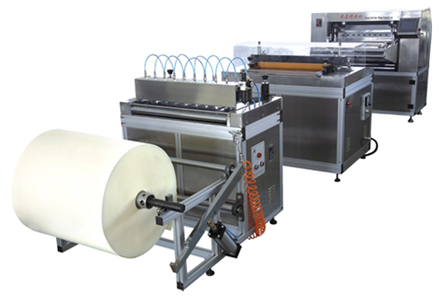 Line Components: 1.Auto de-coiler; 2.Pre-slitting blades; 3.Marker; 4.Automatic counter; 5.Pleating mechanism (equipped with pre-heating and monitor) III. Specifications: A.Pre-slitter 1.Speed: 0.5m-12m/min (adjustable) 2.Width: 32-700mm 3.Power supply: 220V/50Hz 4.Motor power: 0.75Kw 5.Air pressure: 0.6Mpa 6.Machine weight: 300kg 7.Machine size: 1100mm*1300mm*1100mm (L*W*H) B.Marker 1.Max width: 600mm 2.Marking distance: 8-55mm 3.Power supply: 380V/50Hz 4.Motor power: 0.75Kw 5.Machine weight: 300kg 6.Machine size: 1080mm*750mm*1100mm (L*W*H) C.Pleater 1.Max width: 600mm 2.Pleating height: 8-55mm 3.Speed: 0-200 pleats/min (adjustable) 4.Power supply: 380V/50Hz 5.Motor power: 0.75Kw 6.Heating power: 2Kw 7.Heating temperature: normal temperature-200 degree 8.Air pressure: 0.6MPa 9.Machine weight: 500kg 10.Machine size: 1670mm*1200mm*1240mm (L*W*H) IV. Features 1.The pre-slitting machine can accurately and freely adjust the cutting dimensions through frequency converter speed regulation and cylinder blades in different filter sizes. It is simple operated but smooth and effective. After slitting the paper, the conveyor for feeding the filter paper runs in synchronism with the marking machine by equipping the infrared monitoring system. 2.The marking machine can mark in different pleat sizes. The marking distance can be set freely by the computer screen, and the accurate marking distance will be realized with the help of the step motor. 3.The machine is also suitable for folding the iron wire fabric and non-woven fabric of the hydraulic filters, even the multilayer folding. 4.This production line has the stainless steel body and aluminum frame, which is strong, nice and long life.